Our two office locations in Ventura County are conveniently located for those throughout Ventura, Oxnard, and Camarillo. 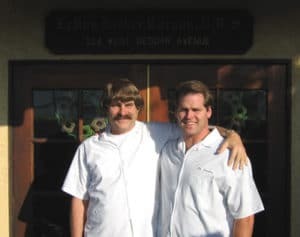 When it comes to caring for teeth, our dentists Dr. Leroy Carson and Dr. Derek Carson are experts at creating and maintaining beautiful smiles. At Carson & Carson, our goal is to provide all of our patients with a painless & affordable plan for oral hygiene that will allow you to keep your natural teeth for a lifetime. Both of our office locations are equipped with state of the art X-ray technology, allowing us to incredibly capture precise measurements of your teeth and gums without the mess of the molds and putty. Why wait for your dentist to get a crown back from the lab when you can have it built and installed on site at Carson & Carson, DDS? We staff an in house lab technician so that we may produce custom fitting dental aesthetics on site to fit your dental needs. We have provided our services to Ventura County for over 60 combined years! Since 1970, Carson & Carson, DDS has grown into being one of the most trusted brands for dental care in all of California. Whether you’re having a dental emergency or are simply in need of a cleaning, we treat patients of all ages and dental needs. From Pediatric to Cosmetic procedures, we have you covered. Call us today at 1-805-983-0717 and receive care from one of the longest standing dental practices in Ventura County: Carson & Carson, DDS. Read one of our many reviews and the discover the unmatched quality of dental service that you can expect from the best dentists in Ventura County.